As more Americans lose their jobs, the U.S. government is actively discouraging the recruitment of foreign workers, from dude ranchers and fruit pickers to lifeguards and computer programmers. At least three avenues of legal immigration have seen roadblocks erected. In the most visible and controversial move, companies receiving federal bailout money now face extra hurdles before they can hire highly skilled guest workers on an H-1B visa. On Friday, the Labor Department will close a public-comment period for a proposal to suspend an agricultural guest-worker program, known as the H-2A. The State Department is asking some sponsors of the J-1 visa -- seasonal employers such as hotels, golf resorts and summer camps -- to reduce dependence on foreign labor. "Basically, because of the economic downturn, it will be difficult to place these people in jobs," said State Department spokesman Andy Lainey, confirming that a letter from the agency asked sponsors to make cuts "voluntarily." With the unemployment rate at 8.1% and approaching double digits, the U.S. finds its longstanding quandary over immigration growing even more difficult. On one hand, fewer Americans have jobs and competition for available work is intensifying. On the other, the Obama administration says it wants to resist moves toward protectionism -- at least in the trade of goods and services -- and will push that view at next week's London summit with the leaders of the Group of 20 nations. Immigration advocates say it is hypocritical not to apply the same approach to the flow of people. "You don't abandon regulations because you have one bad year," said Jeanne M. Malitz, an immigration lawyer in San Diego who represents many growers who are trying to plan their harvests but are uncertain of their labor source. They have relied on the H-2A program, which allows guest agriculture workers to stay as long as 10 months. A spokeswoman for the Labor Department said a decision on whether the program will be suspended for nine months will be made in "a couple of months." The H-2A program requires growers to try to fill vacancies with Americans first. Some farms, Ms. Malitz said, are seeing U.S. applicants for the first time in years, but remain apprehensive. "Will they stay?" she asks. "They quit in the middle of the season. They don't like it." Indeed, an economic downturn tests an argument that has been the bedrock of legal, employer-sponsored migration: Americans won't or can't do certain jobs. Among the highly skilled, perhaps they didn't know programming languages such as Java or C++. Among the lower skilled, they didn't want to work with their hands, get dirty, or sweat. At the Bitterroot Ranch in Dubois, Wyo., owner Bayard Fox said the dude ranch has sponsored equestrians from the U.K. and France, and cooks and housekeepers from Germany, under a summertime J-1 visa -- intended for foreign college students and trainees. But he doesn't plan to do that this year. Business is off, he said, and for a change there are enough Americans applying for jobs. Wyoming's 3.7% unemployment rate is the nation's lowest. "The American pool may be small for highly qualified equestrian jobs, but has gotten bigger on account of the employment crisis," he said. "Some dude ranches are not getting the bookings, so they are just not opening this year." Jack Brooks is the rare employer who calls himself "desperate to find people." Every year, the co-owner of the century-old J.M. Clayton Co. in Cambridge, Md., has relied on a dozen seasonal guest workers, mostly from Mexico, to pick the meat out of Maryland blue crabs all day long, March till November. But H-2B visas, as they are known, were all exhausted this year. So Mr. Brooks is trying to find Americans to do the job. Three people responded to a newspaper advertisement. On the day one was to report to work, she called and said she had found something permanent. "I can't blame her," said Mr. Brooks. "Imagine losing your job every year around Thanksgiving....I fear if we hire a few locals, they'll be gone as soon as the economy turns around." Nearby, Bryan Hall, the fourth-generation owner of G.W. Hall & Sons, is in the same predicament. Dorchester County, where the crab-processing industry is based, had a 9.1% unemployment rate in January, second highest in the state. "I know unemployment's up, but I can't find Americans to do this job," Mr. Hall said. Critics of the visa programs blame sponsors for driving down wages. Mr. Brooks said he offered the no-show hire an entry-level salary of $6.71 plus some incentives by piece and pound, and the potential to double her salary with experience. "With our competition in Southeast Asia, we can't pay more," he said. "It's just better to close." The irony isn't lost on both sides of the debate: Foreigners are needed so Americans can compete with...foreigners. To be sure, nearly all players in the global economy have grappled with the question of how open borders should be. In Europe, several countries with steep unemployment rates are paying migrants to return home. The U.S. government's attitude marks a stark turnaround. During the boom years, Congress actually raised the number of H-1B visas, reserved for highly skilled immigrants. Now, some economists have suggested that allowing more foreigners into the U.S. -- say, an immigrant who buys a house in exchange for a green card -- would actually help jump-start the economy. But a public beleaguered by lost jobs seems loath to embrace such an idea. The federal economic-stimulus package restricts H-1B hires among companies that receive funds from the Troubled Asset Relief Program. They must prove they have tried to recruit American workers at prevailing wages and that foreigners aren't replacing U.S. citizens. Enter the USA DV2012 Green Card Lottery. 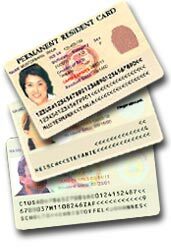 55,000 Green Card’s Must Go Each Year. Return to USA Diversity Lottery's immigration news page to read more immigration news. Can Obama afford to ignore immigration? Will the Obama Administration Impact Immigration? Shoudl Illegal immigrants without Social Security numbers get stimulus payments? Will illegal immigrants take the stimulus jobs?